Take a look at pictures of scrap quilts made by members of the online quilting community. You'll find a wide variety of quilts here, and maybe find tips and ideas for your next scrap quilt. Any quilt pattern can be used to make a scrap quilt. Don't worry too much about the colors in your quilt. Instead, pay more attention to contrast among the patches, because contrast allows designs to either emerge or blend. To learn more about contrast, read Color Value for Quilters. A quick look at a basic color wheel explains color dominance, an important ingredient when designing a by quilt. From Dana: I hand pieced and hand quilted this quilt for my husband, using scraps that looked as close as possible to Depression-era fabric. Several pieces of fabric in this quilt actually came from scraps that belonged to my great-grandma's aunt (pre-1900). From quiltermomma1: I made this quilt for my son's graduation from the law enforcement academy. Just Do It was his class's motto. I made it extra large, because he is 6'5" tall. From Phxwmn: I won all of these beautiful scrappy heart blocks in the Quilting Forum. I used the disappearing nine-patch method with the heart blocks placed as the nine-patch cornerstones. It was a successful experiment and I really enjoy the way it turned out. What made it really special was receiving a heart block from all the people that participated in the block exchange. From Debby: "I made this from a pattern from this site. It was a fun, easy project and a great way to use up my scraps." From Jennifer: This quilt was made from Janet's pattern, Mock Log Cabin. It was made for my husband's teenage cousin. From Robicole: This is a top made from the tulip block swap in 2007. From Peggy: I made this for my daughter to keep as an heirloom. It is made to fit her king size bed and hangs to the floor. The quilt measures 125 X 135 inches. Quilt by Momof11: This quilt was a wedding gift. The pattern is Scrappy Trip Around the World by Bonnie Hunter. It's a great pattern to use up leftover 2.5" strips of fabric.I used a solid black strip in each block in the same position and arranged blocks based on their diagonal color to get a less random look. 72" x 60"
From Robicole: This is the quilt top I made with the blocks I won in the Quilting Forum's block lotto in May 2006. From Robicole: This quilt was made from blocks swapped in the Penny Pincher 7 swap. That swap was inspired by a quilt I saw when I was in North Caroline for the quiltfest with Janet Wickell. From Tara: This quilt was a Christmas gift Madeline two weeks before Christmas. My boyfriend asked me to make a quilt that would emulate his 'Granny Blanket,' which was crocheted from scraps by his granny. The Granny Blanket is all squares and rectangles in all colours imaginable. This was my first attempt at a true scrap quilt. All of the squares are 4", sewn by strip piecing and rotary cutting. The idea was to have no two identical fabrics touching each other. I made the quilt from my fabric stash and finished the quilt by tying it with yarn instead of hand quilting I turned the backing to the front instead of sewing binding around edges. From Betty: I started making this scrap quilt by sewing crumbs to strips. Then I just grabbed scraps and added them until I had six-inch squares. I used leftover strips from bargello and other blocks. It is a queen sized quilt. Ribbon Star Scrappy Lap Quilt. Scrap Quilt by Jean B. From Jean: Ribbon Star is a scrap quilt that measures 60" x 60". From Nil: This is a lap quilt made from scrap pieces of fabric. It was made for my daughter to use at work and measures about 50" x 30". She works in an open truck outside an airport in the winter. The quilt will keep her legs and lap warm. She loves the quilt. From Peggianne: Star of the Orient is a king size scrap quilt that I started over 10 years ago for my son. It is hand pieced and hand quilted. From Haubon Quilts: Sassafrass Leaves is a 67" X 68" scrap quilt that was made from the vault of scraps I have saved since I started quilting 14 years ago. From ncquiltmom: This is my first scrap quilt. Since I'm fairly new to quilting, I gathered these scraps from end of bolt bins. From Haubon Quilts: I made this scrappy bed quilt for a newlywed cousin. It is an 82" X 68" quilt made from scraps I had saved since I started quilting. From Momof11: I made this scrap quilt from Penny Pincher swap blocks from the Quilting Forum. I gave the quilt to my 4th son on his 12th birthday. The quilt is about 60" x 80". From Momof11: I made this scrap quilt for a friend who was moving away. I think the color placement makes these Sisters Choice blocks look like flowers. Size: 50" x 66"
From Angie: I was introduced to crazy quilting by my sister when she made me a beautiful Victorian crazy quilt for my birthday. I was anxious to make a bedspread and didn't want to take the time to buy matching colors, so to make this quilt I used everything I had available in my sewing room. I had scraps from other projects as well as clothing in my throw away pile. From Milli: I've been collecting feed sack fabric for years and finally got around to making a quilt with some of the sacks. I remember my aunt using the feed sacks to make aprons and other items when I was little so it was fun to work on the quilt. 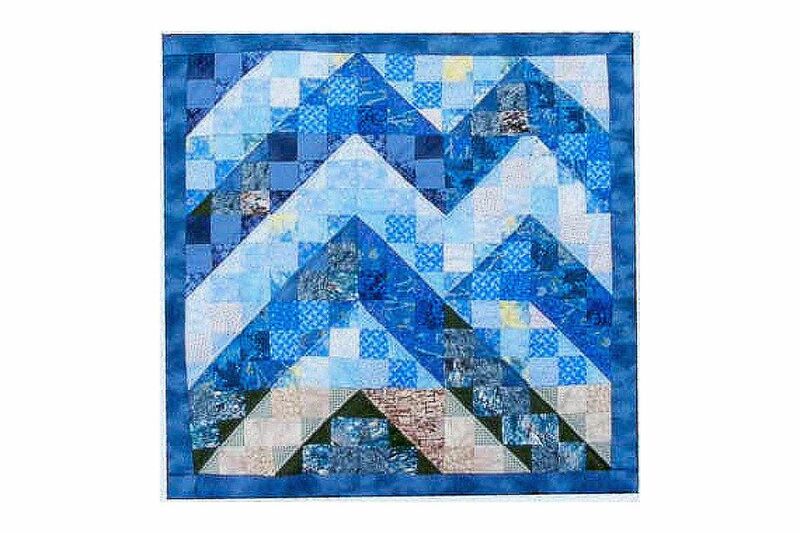 From Sewbeth: This single bed size scrap quilt is made with 3-inch squares sewn into half-square triangle units. From Lina: his 60" X 38" scrappy baskets quilt was made of scraps from previous bed covers I have made. I focus my quilting on bed covers and baby quilts, but since our house is not painted yet, I made this wallhanging thinking that it would lighten up our dining room -- it worked!. From Carol: This scrap quilt is made on the back of my daughter's runner from her wedding. I cut strips of interfacing in all different widths and in 72" lengths and then just grabbed fabric from my stash without looking and added every which way to the strips. I saw the idea in an old magazine, but that was a small quilt -- mine is queen size with 8" squares for the border (I sewed them every which way to the interfacing). From Claire: This is my first completed bed size quilt. Several of our club members (Otago Q&P N.Z.) made this, and the original version called "Autumn Splendor," from a book in our club library. It is queen size and I used bottle green as my contrast. From Robicole: I made the scrappy houses quilt from the blocks we swapped in the Penny Pincher Happy Scrappy Houses Swap in 2007. From Robicole: I made this maple leaf scrap quilt with the winnings from the block lotto in 2007.